10 proposals for active travel schemes – from eight Scottish councils – have each been awarded an initial £50,000 as part of a multi-million pound competition. Sustrans Scotland’s Community Links PLUS (CLPLUS) competition, funded by the Scottish Government, aims to deliver ‘pioneering and game-changing’ projects which inspire more people to walk and cycle for everyday journeys. 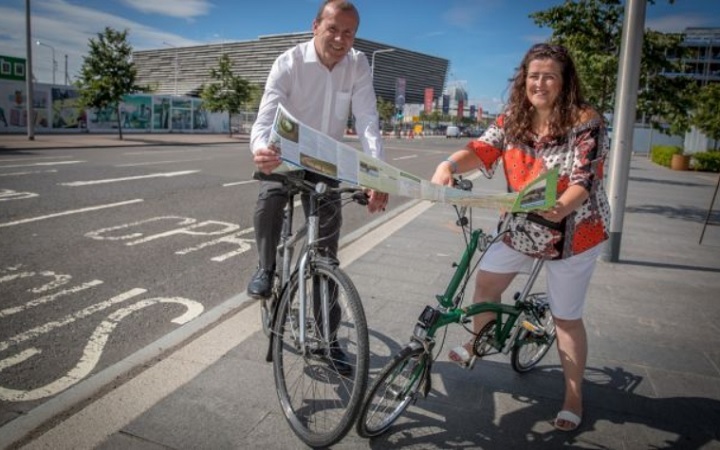 Proposals from Angus, Edinburgh, Dundee, East Renfrewshire, Glasgow, Perth and Kinross, North Ayrshire and South Ayrshire councils have all been selected – many of which involve the creation of a network of segregated cycleways. Each council is now required to further develop their proposal(s), with the judging stage of the competition set to take place in April 2019 – when the successful projects will be selected and then taken through to construction. Sustrans and the Scottish Government hope the competition will demonstrate that designing places around the needs of people delivers a wide range of benefits including boosting local economies, healthier communities and safer, more attractive streets. Michael Matheson, Scotland’s transport secretary, said: “The Community Links Plus fund generates some of the most exciting ideas for introducing the infrastructure we need to encourage more people to leave their cars at home and make journeys by bike or on foot. “It’s very encouraging to see we have eight different local authorities which have not only identified opportunities in their areas but have been shortlisted for this stage of the competition. Matthew Macdonald, Sustrans Scotland head of infrastructure, said: “These 10 shortlisted projects are a bold step towards a healthier, more sustainable and vibrant Scotland which designs places around the needs of people over vehicular access. But they’re not exactly cycling are they. Both of these cyclists are on the footway! Great that Scottish Government has increased funding for more cycle routes. Will we be reading sometime soon about a government-led behaviour change programme that needs to go along side the infrastructure to make it successful?